When you are in the presence of His Holiness the Dalai Lama, you are in the presence of compassion itself. But how many of us will have the opportunity to personally experience the man known as "The Ocean of Wisdom"? 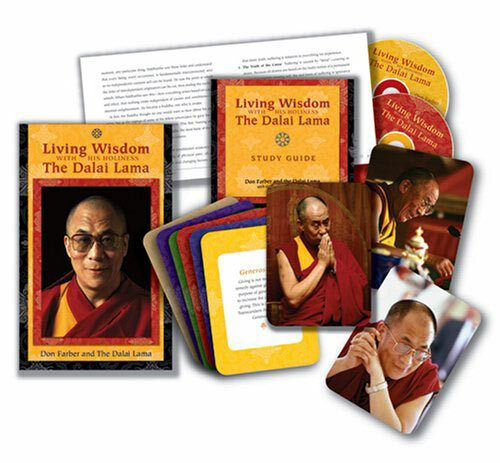 Now, Living Wisdom gives you the chance to immerse yourself in the grace of His Holiness, and to receive the transformative power of his teachings in your own home, including: 47-minute DVD spanning twenty-five years of Don Farber's photography of His Holiness with more than 400 extraordinary images set to sacred Tibetan music, 145-page book gleaned from His Holiness's classic lessons on The Six Transcendent Perfections. These are the way of the bodhisattva, the qualities we must cultivate in order to reach enlightenment. Musicians, monks, and nuns honor His Holiness through time-honored chants and original compositions on CD. Includes traditional chanting by the Dalai Lama.